Love is at the heart of prayer and the heart of mission. Sister Theresa with a Sudanese family. Sister Theresa and Sister Madeline greeting a Sudanese mother and child. Sister Theresa’s words are at the core of our Maryknoll spirituality. They bring to life our deep commitment to the Gospel message and to making God’s love visible in all our ministries. Sister Theresa Baldini and Sister Madeline McHugh have amazing stories from their years in mission in Sudan. But before we share them, we want to tell you about a very important part of our congregation: the Maryknoll Sisters Contemplative Community. This prayer community became a reality in 1932 and continues strong today. Prayer and sacrifice are at the heart of our contemplative community for Sisters Theresa and Madeline. Our Sisters who become a part of this community cherish silence and solitude. Silence helps create a listening attitude to God and the promptings of the Spirit. Solitude nurtures an inward journey – emphasizing our dependence on God and our union with all of humanity. Our Sisters’ contemplative way of life is simple, rooted in mission, and focused on the needs of others in active ministries around the world. her son Junior in Sudan. Please help us go forth in 2016 as nurses, doctors, teachers, social workers, environmentalists, contemplatives, and more. Your gift today will help our Sisters give voice to the poor, the ailing and the marginalized. Whatever gift you can give will be deeply appreciated. May 2016 bring you peace and joy. 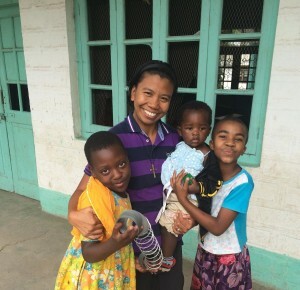 Sister Genie Natividad, originally from the Philippines and serving in Tanzania, recently wrote asking for our help for the children in her care. Little Aisha and Mwajuma, shown sitting in her lap (see above), were severely abused by the person who should have loved them most: their mother. Aisha was badly beaten by her mother. Mwajuma was starved and neglected by her mother. When Mwajuma was found, she was skin and bones! Her mother was put in jail for a while. After she was released, she never came to see her daughter. Sister Genie says many other children suffer similar abuse. Some of these precious children were burned, beaten, raped and victims of other atrocities too horrible to mention. As we celebrate the birth of the Christ Child, I am reminded that our Savior was born into a world of poverty, oppression and injustice. It is my hope that you will open your heart to the children who suffer in our own world by giving a Christmas miracle today. Please help support our critical ministries with children and others in need in Tanzania and around the world by sending your gift today. Sister Jane Bullesbach, an angel to the Guatemalan people. Sister Jane shown examining baby Joselito, 4 months old and weighing 3 pounds. Sister Jane, a physician, started her lifelong ministry in Guatemala in 1983. She has combined spiritual and medical healing in her ministry with the poorest people. “My one desire is to help make life more bearable for the people. Before we came (Sister Mary Lou, also a physician, is with me) little or nothing was being done in the diocese to provide even basic health care for the people living in villages along the coast. Our main focus has always been preventive medicine. We are convinced that education and prevention are essential for improving the health of the poorest people in rural areas. Poverty in Guatemala is widespread and deeply entrenched. Approximately 51% of the population lives in rural areas, and most are the poorest of the country’s poor. Curable infections are an everyday problem. One of the causes is poor sanitation, especially contaminated water. The indigenous population is especially affected because of their lack of access to health, education and economic opportunities. This is why Sister Jane’s ministry is so very important and vital to people desperately wanting a better quality of life but unable to get even basic health care. And this is why your support is such a blessing. Thank you for your assistance for all our Sisters who are deeply committed to making God’s love visible. Thanksgiving is a time of coming together with family and friends – and sharing a meal together. Please pray for Sister Jane and all our Sisters serving in the most troubled spots in our world. Thank you for helping us make life easier and happier for the very poor. You are truly a blessing this Thanksgiving. Thank you for being our partner in faith and mission as we share responsibility for the living Earth, the well being of the community of life and the good of all people around the world. Our International Bazaar presents an opportunity for our Sisters to share our rich experiences with you. Please join us in person, or by participating in one of the ways described below to make this event our best ever! The Bazaar will be held on Saturday, October 24 from 10 a.m. – 3 p.m. at Maryknoll Sisters Center, 10 Pinesbridge Road, Ossining, New York. The Bazaar features crafts and unique items from our mission countries that make one-of-a-kind gifts for family and friends, as well as crafts lovingly handmade by our Sisters. If you can’t join us, I hope you will consider sponsoring a Bazaar Booth to help cover overhead costs of booth operations and allow all funds raised to go directly to our mission work. Please participate in our Cash Raffle, too. Get your tickets in early to have two chances to win. There will be an early bird drawing on Friday, September 25, for prizes of $500, $250 and five $100 winners. A second drawing for another seven prizes will take place on Bazaar day. I am sure you’ll want to contribute to the success of the Bazaar and have a chance to win a cash prize. Below you can make a donation for a ticket. However, no purchase is required. Suggested donations are: $10 for a sheet of 12 tickets; $5 for six tickets; $1 for each single ticket. Winners need not be present to win. Prize money will be sent by check. Please note the amount of tickets you would like, entered on your behalf, in the Comments/Prayer Intentions section on the donation tab below. A sincere and grateful “thank you” from all of us for your faithful support of our global mission outreach. Together, we are making God’s love visible in our world. We pray for you and your intentions daily, asking God to bless you abundantly. From the very beginning Sister Noel had a deep conviction that she was called to mission. She has served as a Maryknoll Sister for 70 years. Sister Noel has spent her life helping others as a school teacher and is now retired and living at the Maryknoll Sisters Residential Center. Sister Noel’s first mission was teaching at St. Theresa’s Chinese Mission in Chicago. After 10 wonderful years with them, Sister Noel was sent to the Maryknoll Sister’s secondary school in Hong Kong. “You are very much a part of Sister Noel’s life – when she was on mission in Hong Kong and especially now when she needs good health care. Your gifts help to support the medical treatments and living arrangements for her and our retired older Sisters – those who served selflessly in the poorest places on earth. Thank you! You are such a part of our ability to carry out our mission of making God’s love visible here and around the world. On behalf of all of our Maryknoll Sisters thank you! Your support is deeply appreciated! And your continued support is needed right now – for Sister Noel and all our Sisters. Please pray for Sister Noel, all our Sisters at the Residential Center and all those serving in the most troubled spots in our world. Thank you for helping us make life easier and happier for others. You are a source of strength and we are grateful. We will always keep you and your loved ones in prayer asking for God’s protection. “I cannot speak today but I can pray. I pray for the whole world. My other Sisters at this residence inspire me because they are living out their call to mission. I would rather be helping others than others helping me. I wanted to be independent. My daily struggles were made easier by the kindness of others caring for me. I have always relied on God’s strength and He has never failed me. He never lets me down just like our partners in mission who I pray for everyday. Fill out the form below to donate now and support our Sisters. Sister Bernice has a hard time closing the window. I am writing to you today with an urgent need we have at our Motherhouse. After 83 years of use we must replace all 403 windows. The old ones are drafty. They easily get stuck and the Sisters cannot close them. Some of the windows only open 2 inches; others not at all. In the winter the cold comes in and the heat goes out. In the summer the opposite is true. More than that, our Motherhouse is home for many of our elderly and infirm Sisters who dedicated their lives to serve in the poorest missions around the world. Some of these dear Sisters are very frail and we are concerned for the safety and well being of these and all of our Sisters. The old, drafty windows need replacing as soon as possible to ensure that our Sisters live out their lives in comfort and without strained backs and other injuries. Our goal is to raise the $400,000 needed for the new windows. We are relying on your continued generosity to help fund this project. Be assured that any funds raised over the $400,000 goal, will be used where they are needed most. We are deeply grateful for your friendship, prayers, financial support and especially for your commitment as our partner in mission. Thank you so very much for your continued generosity and your loyal support. You are a blessing! P.S. We urgently need your help to raise $400,000 to replace the windows in our Motherhouse immediately. Donations received over our goal will go to help our greatest needs. Thank you for any help you can offer! P.P.S. Please do not forget to send your intentions on the enclosed form so our Sisters can remember them in prayer. Fill out the form below to donate to the Window Campaign. Thirty-five years ago in El Salvador, Maryknoll Sisters Ita Ford and Maura Clarke were martyred by government militia, simply because they were aiding victims who died during the country’s 12-year civil war. Today, Sister Mary Annel carries on the faith in El Salvador, putting her own life on the line to serve the poor. Sister Mary, who is a physician, works in a poverty-stricken community where gang violence runs rampant. She administers the Salvadoran Foundation for the Fight Against AIDS. Her team operates a clinic from which they provide loving care and weekly treatment to over 100 people suffering from HIV/AIDS. Sister Gloria Ardenio Agnes works in the clinic and visits people in their homes. She and her team provide food supplements where basic nutrition is lacking and alternative health therapies. They also provide desperately needed education and uniforms for the children to wear to school. Mrs. Sample, thanks to your prayers and support, our Maryknoll Sisters are able to serve on the frontlines amid violence and conflict to build peace and bring the love of Christ to the poor. I humbly request your prayers and support for Sisters Mary and Gloria … and for all our Sisters who work for peace and justice throughout the world. Your gift will help our Sisters in their struggle against poverty and oppression. Whatever gift you feel comfortable giving – large or small – will go a long way to help our Sisters in their ministries. Today in El Salvador, the flame for social justice still burns and the passion against oppression still grows. Many young people are beginning to find the courage to speak out on behalf of social justice for themselves and their country. Progress is happening. Sister Mary sees Amelia, an AIDS patient at the clinic, where her team provides loving care to over 100 HIV/AIDS patients each week. Thanks to our donors’ faithful support, CONTRASIDA — our HIV/AIDS program — is changing lives for good. The program provides medical care, advocacy, education, peer support, even meals and homework. It does so with an emphasis on human dignity. And it has had a great impact on HIV prevention and on helping young people change cultural patterns to avoid infection. And our Maryknoll Sisters continue to work and to prepare the Salvadoran people to win for themselves the freedom for which Christ died. Thank you for doing your part in bringing peace and justice to the poor through the ministries of our Maryknoll Sisters. Please know that we will always keep you and your loved ones in prayer, asking for God’s protection. P.S. Thank you for praying for our Sisters’ safety and for supporting them in their ministries. I know you journey with us to all parts of the world and we are grateful. Please send your special intentions today. We will always keep you and your loved ones in prayer. Sister Rosemarie Milazzo is ready to return to Iraq to help build peace by building relationships with people. A Maryknoll Sister for more than 55 years, she has served in places like Tanzania, Kenya, the Democratic Republic of Congo, and Iraq. She’s an educator, a pastoral assistant and more recently a peacemaker. Sister Rosemarie is a pioneer who risks her own safety and life in places where people live in fear, women are raped and children are taught to fight. Sister Rosemarie joins many of our Sisters who are on the frontiers, often putting themselves at risk to respond to the suffering and needs of our times. They sit with people and listen. No matter what country they serve in, they are always trying to understand what hurting people are going through. They hold sacred the pain people are feeling and pray to find peaceful solutions to some very complicated problems. Your compassion and generosity enable and empower our Sisters to continue their critical ministries. I hope I can count on you today to send your gift to help sustain Sister Rosemarie and all of our Sisters who serve the poor, the oppressed and the suffering. As a partner for peace, Sister Rosemarie lives for peace through her actions… and sometimes there are no words – only actions. I am counting down the days to my return to Iraq. The people there suffer from the conflict and unrest. My ministry this time will be to serve in the border camps to help protect Syrian refugees. Already this month, there are 4,000 displaced families with children who suffer the terrible conditions of tent camps. I hope to help keep families together and bring them comfort and peace. It is such a privilege to do this work. Sister Rosemarie sets an example for us all to build peace in our world. She shows us how to speak with our hearts – to listen to each other, voice our concerns, our perspectives in a loving, peaceful way. Please pray for Sister Rosemarie – for her safety and for the safety of all our Sisters. They are serving in the most troubled spots in our world promoting and protecting peace as they make God’s love visible to all. Your loving, compassionate and charitable heart empowers our Sisters to be peacemakers. Thank you! We will always keep you and your loved ones in prayer, asking for God’s protection. P.S. Please join us every morning at 10:30 a.m. (eastern) in a “Power Prayer” for world peace. Please send your intentions, along with your gift. Our sisters will pray for you and your requests.